The new service provides low latency, direct access to hyperscale public cloud providers like Amazon Web Services (AWS), Microsoft Azure and Google Cloud Platform. Opus Interactive announced today it is now offering Lit Network Service for its Hillsboro and Portland, Oregon-based data centers. This was made possible when the company agreed to long-term dark fiber leases with CoastCom, Zayo and Tata Communications. Opus Interactive’s flagship facility is located in Infomart Data Centers in Hillsboro and its Portland data center is located in Tata Communications’ BB1 facility. This new, fully redundant and multi-provider ring connects the Infomart Data Centers campus (21515 NW Evergreen Parkway, Hillsboro, OR 97124) to EdgeConneX® (23245 NW Evergreen Pkwy, Hillsboro, OR 97124); The Pittock Block (921 SW Washington St., Portland, OR 97209); and Tata BB1 (1225 W. Burnside Street, Portland, OR 97209). Opus has lit this ring with capacity to provide network services from any of these facilities from 10 megabits to 200 gigabits per channel for its customers and partners. The new set of lit network service offerings for Opus provides its customers the flexibility of gaining access to any carrier in the Oregon market from Infomart, EdgeConneX and Tata BB1. New offerings include 1Mbps, 100Mbps, 1Gbps, and 10Gbps up to 200Gbps transport options. 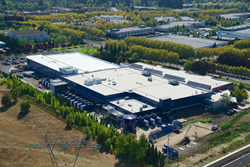 As the retail cloud and colocation provider for Infomart Data Centers' Hillsboro location, Opus Interactive offers the facility’s wholesale tenants as well as Opus and EdgeConneX's customers backhaul to all the available providers located within the Pittock Block. It also provides low latency, direct access to hyperscale public cloud providers like Amazon Web Services (AWS), Microsoft Azure and Google Cloud Platform. "Our vision is to create an open and interconnected environment at Infomart Portland," added John Sheputis, President, Infomart Data Centers. "We are enabling our customers to further extend their interconnection options. Our relationship with Opus Interactive plays an important role in helping us realize that vision." Opus can also provide customers with access to partners like Megaport and PacketFabric for access to Google Cloud Platform, Oracle Cloud, and more. These strategic additions to Opus’ portfolio play well into the Company’s multi-cloud, hybrid IT offerings, allowing customers to run their applications and infrastructure on any cloud. Opus can also manage and monitor their customer environments across any cloud through a single pane of glass. Founded in 1996, Opus Interactive provides cloud hosting, managed services and colocation from Tier III+ data centers in Hillsboro, Portland, Silicon Valley and Dallas. Through close partnerships with industry leaders and a commitment to customer satisfaction, Opus Interactive has earned a reputation for customized IT solutions that fit unique requirements for equipment, scalability, budget and future growth needs of its customers. Headquartered in Portland, Oregon, Opus Interactive is an accredited member of the International Managed Services Provider Alliance and is PCI-DSS, HIPAA, and SSAE16 audited. Infomart Data Centers offers wholesale and colocation facilities in four markets throughout the United States: San Jose, Calif.; Hillsboro, Ore.; Dallas; and Ashburn, Va. For more information, please visit http://www.infomartdatacenters.com. CoastCom provides high speed Internet, data and voice services for customers on the Oregon Coast. They also operate a cable landing station and provide terrestrial fiber routes for submarine cables from the coast to the Portland Metro Area. Recently acquired by Wave Broadband, CoastCom is now part of a gigabit fiber and broadband services provider for West Coast business and residential customers. Wave delivers a range of solutions for businesses, including custom fiber networks, high capacity Internet access, data transport, voice services, and colocation hosting. For more information, visit wavebusiness.com.